The Woo-Crew has been working feverishly on their Iceland I.S. projects. 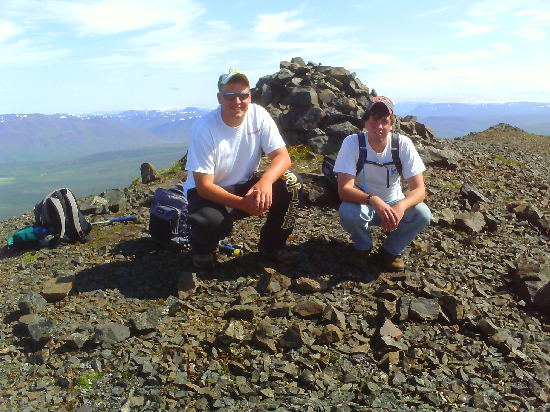 Rob and Todd have been climbing the northern end of Vatnsdalsfjall for days, searching for zeolites. The last day was spooky as the thick fog cover came in and out with the wind direction, making it impossible to see at one moment and clear blue skies the next. 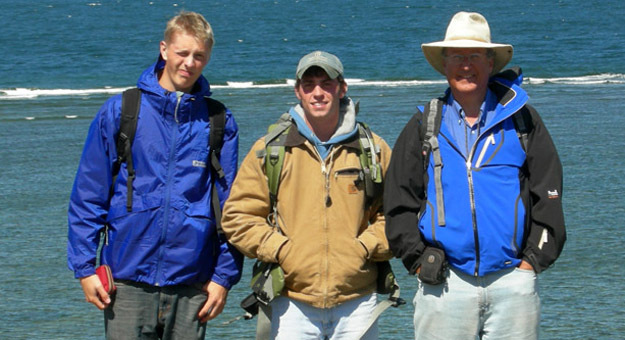 Rob and Todd accomplished so much that they have been able to help Yexary, a Syracuse geology major, in her field area. 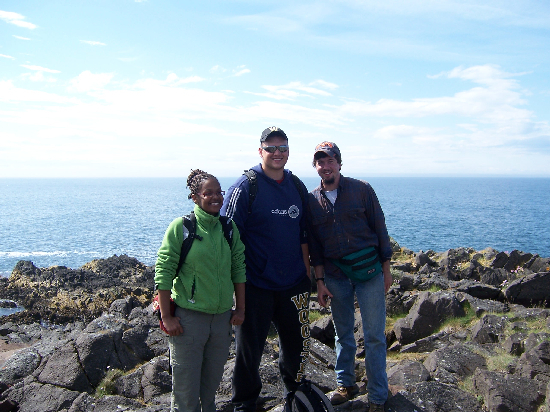 Yexary, Todd, and Rob pausing to pose while mapping gabbro by the shore in Skagastrond. Not only does the Iceland crew excel in Mineralogy and Petrology, but also in Invertebrate Paleontology (much like the Estonia group). We’ll see your unaltered hard parts and raise you an zeolite-filled olivine basalt! 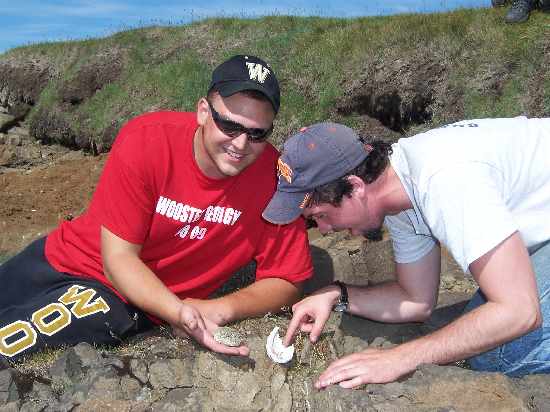 Todd and Rob in the fossil-crouching position on the Skagi shore. The same day that they hunted fossils, Rob and Todd saved a baby duck that was struggling in a net on the shore. They are genuine heroes. Adam, meanwhile, is on the hunt for the elusive rhyolite. After some early success, he has run into basalt where rhyolite has been mapped. Unfortunately, all of the rhyolite is mapped at the top of the mountains, so Adam has made several trips to the top just for the fun of it. 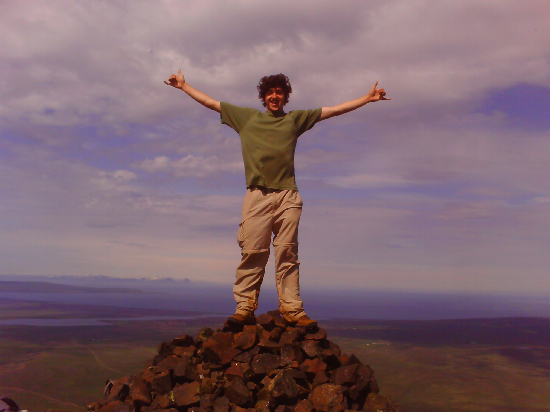 Adam at the top of Svinadalsfjall. 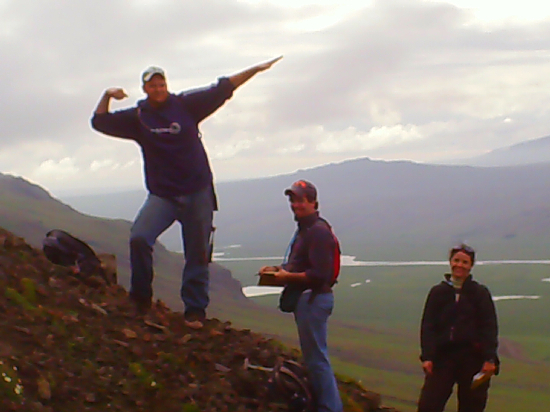 At the top of Svinadalsfjall, Adam, Rob, and Todd found a word spelled out in rocks: L-i-e-t-u-v-a. We don’t know what it means, but we decided to spell U-S-A in rocks right next to it. Rob and Todd claim a mountain for the USA. Todd strikes a pose on the way up Vatnsdalsfjall. Estonian Independent Study fieldwork completed! KURESSAARE, SAAREMAA, ESTONIA–Today in a cold drizzle we measured the last section and bagged the last sample for our field projects. Tomorrow we leave the beautiful island of Saaremaa and drive to Tallinn. The next day we will study fossils in the University of Tallinn collections to complete our survey of the Silurian communities preserved in this part of the Baltic. Rob McConnell is sorting out the paleoecology and paleoenvironments of the upper Mustjala and lower Ninase Members of the Jaani Formation (Wenlock) at three sites on the northern coast of Saaremaa. He has some very cool stromatoporoids, corals and bryozoans which are sometimes complexly intergrown and are almost always bored with long, thin holes. Wonderfully symmetrical and large stromatoporoid (a kind of fossil sponge) preserved in the Undva Cliff, northwestern Saaremaa coast. 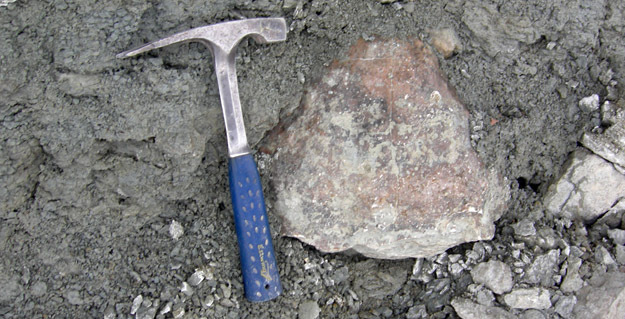 The surrounding blue-gray sediment is a calcarous clay with other smaller fossils such as brachiopods and bryozoans. The stromatoporoid itself is a community with endosymbiotic corals and worms. (Mustjala Member, Jaani Formation, Wenlock). Palmer Shonk has a single locality on the Sõrve Peninsula of southwestern Saaremaa with an extraordinary accumulation of crinoids in both growth positions (as extensive holdfasts) and as storm-tossed skeletal debris. These rocks and fossils are part of the Aigu Beds (Kaugatuma Stage, Pridoli). We think that there were low mounds of calcareous mud colonized by numerous species of crinoids, bryozoans and stromatoporoids which were occasionally swept by strong currents and buried in coarse sand and gravel made almost entirely of crinoid bits. Palmer will work out the ecological structure of those original communities and then the environmental history which led to these thick storm deposits. Crinoid holdfast seen sideways in the Aigu Beds, Kaugatuma Stage, Pridoli. This structure is like the tap root of a tree. It penetrated the sediment, tapering downwards, and produced lateral branches (radices) which held the crinoid in place in a relatively energetic marine environment. Unlike a tree root system, this crinoid holdfast did not take up nutrients for the organism. Crinoids are animals which filter the seawater for food with a head and arms at the opposite end of the stalk. The Wooster 2009 Estonia Geological Research Team. Photograph kindly taken by our colleague Bill Ausich. UNDVA CLIFF, SAAREMAA, ESTONIA–I’ve never had anything good to say about rain during geological fieldwork, but our colleague Bill Ausich from Ohio State University insisted that it makes echinoderm fossils stand out better against the rock matrix. Turns out he’s right. 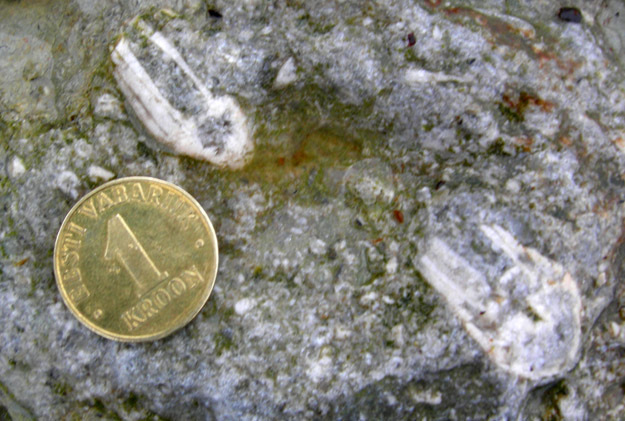 Two beautiful calices of the eucalpytocrinid crinoids at the Undva Cliff locality on Saaremaa. When wet the pure calcite of their skeletons contrasts brilliantly with the surrounding dark rock matrix.